THQ: Death of Consoles Means "Tremendous Opportunity"
The ideal future for both videogame publishers and players is one that doesn't include the existence of consoles, according to THQ's CEO. THQ CEO Brian Farrell has thrown his hat into the ring on the future of consoles, or lack thereof. Farrell sees the death of consoles, and the rise of cloud gaming, as a humongous opportunity to get more consumers into videogames. In an episode of Game Industry TV, Farrell predicts that digital distribution will expand far beyond its current phase. "It's not just going to be casual games, it's not just going to be MMOGs, it's going to be all sorts of gaming experiences," he says when speaking of digital distribution's future. This itself is not that crazy of an idea, but in Farrell's digital future, he doesn't necessarily see the need for consoles. In fact, he sees them as a barrier that is keeping people from playing games. So what's the solution? 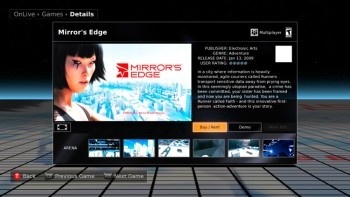 Cloud gaming services like OnLive and Gaikai, perhaps. "I am a huge believer in the concept of cloud computing," Farrell admitted. On cloud gaming, Farrell said: "The concept of lowering the entry barrier to consumers for gamers to get into our games by not having to shell out for the hardware is a tremendous potential opportunity." He seems to believe cloud services could ease players into gaming more easily, and would also be a better avenue for Nintendo, Sony, and Microsoft that have to spend millions of dollars on developing expensive hardware. He asks: "Why do we need a $1,000... that's what these consoles actually cost the manufacturers to make. Why do we need that computing power?" Things happen slowly, but digital distribution is on the rise and cloud gaming is attempting to garner consumer attention. People from Farrell to EA founder Trip Hawkins to id's John Carmack are putting their belief into cloud gaming services, but they're still such a foreign concept to the majority of gamers that I truly wonder if they'll be able to catch on like much of the videogame industry hopes.